I was weary of "The Eagle". Visually, it looked very appealing, but its star is Channing Tatum and let's just say, the guy isn't my favorite actor. He does better in smaller roles, like in last month's "Dilemma" or the underrated "She's the Man" but when he headlines a movie we usually get crap like "Dear John" or "GI Joe". I wanted "The Eagle" to be good though, I wanted to see Tatum's bid to be the next action star be a promising one. This isn't a bad start. The story is simple and in a surprising turn, this is actually an elegant and quite movie. It isn't the large swords and sandals epic you might have expected, what it really is is the story of two people from different worlds coming together for a common cause. And though that may sound a tad cliche, the film actually presents the always interesting topic of loyalty and perspective. Director Kevin MacDonald doesn't dig into his themes with his shot choices, but cinematographer Anthony Dod Mantle captures the sweeping hills and landscapes of Scotland and Hungary with amazing scope and beauty. The entire film is tinted with a yellow and gray tone with hints of blues and greens thrown in. If anything, this movie is pretty to look at. What MacDonald does do though is capture his simple story and his two lead actors in a way that keeps us intrigued its entire two-hour run time. It is essentially a road trip film set in 120 AD. Which makes the performance of Tatum so important, if he had played his usual persona this would have been a failure, but the guy at least attempts a kind of accent and is paired with the always pleasant Jamie Bell. 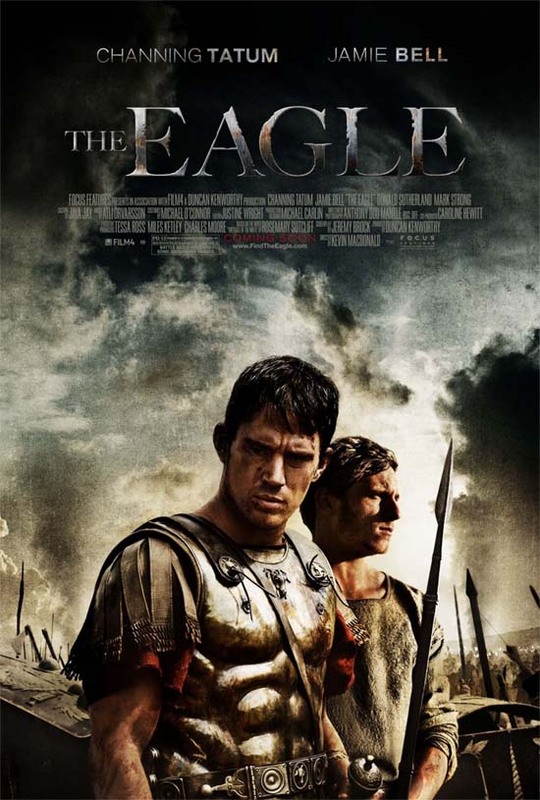 Bell plays Esca, a slave to the Roman Marcus (Tatum) who is somewhat forced to venture out on this journey with his master to search for the golden eagle, a symbol for Rome that was lost when Marcus's father along with 5,000 other men disappeared upon marching into Scotland for battle. The main focus of the film is the relationship between Marcus and Esca. It begins when Marcus saves Esca from being killed by a gladiator for sport. Esca refuses to fight, demonstrating a bravery Marcus easily recognizes. When Marcus decides to go after the eagle he takes Esca along seeing as he has to venture into British territory. From that point on we have a trust in Esca that never feels like it wavers, even when he seems to completely be turning on his master, as an audience we don't doubt him and that is just a testament to the skills of Jamie Bell. Bell fashions his character to the kind of hostage that almost has irrational feelings towards his master. He argues with Marcus that just like his father fought to defend Rome his own fought and died to defend his own home. And while it starts out as if Esca despises Rome and all that defend its honor, he eventually becomes a friend, with positive feelings toward his captor, he genuinely wants to help his master. It is almost as if Esca suffers from Stockholm syndrome, but as with many of the themes in "The Eagle" the film elects not to dig too deep into things and would rather just scratch the surface and move along. This is an entertaining film though, I just feel, at least story wise, that it had much more to offer. I have not read the Rosemary Sutcliff novel, The Eagle of the Ninth, on which this is based but I am sure it might give me more of the story I am looking for. I cannot be mad at the film for keeping it simple though, sometimes it is nice to see a simple mission done up with grand decoration. There may not be much to it, but it is well paced, well shot, and surprisingly well-acted, except for those American accents on what are supposed to be Roman and British soldiers. The film also has appearances from the likes of Donald Sutherland who, just as he did in "The Mechanic" a few weeks ago, mentors the young leading man and then is not seen for the rest of the film. Mark Strong also makes an unexpected cameo as a lost soldier of Marcus's fathers regime. And though his role is crucial to the climax of the film, such a great presence should not have been so under-used. And so, "The Eagle" may not be as good as it should be but it is a pretty decent sword and sandals buddy picture that takes us on a beautiful trip and offers up some intense battle scenes while never delving too much into its own psychology. Plus, I can't complain too much, Tatum didn't make me cringe and I found it to be a rather enjoyable viewing experience. The final shot almost hints that there might be another adventure ahead for these two, but let's hope they leave it at this. I liked it, but wouldn't go back for seconds.